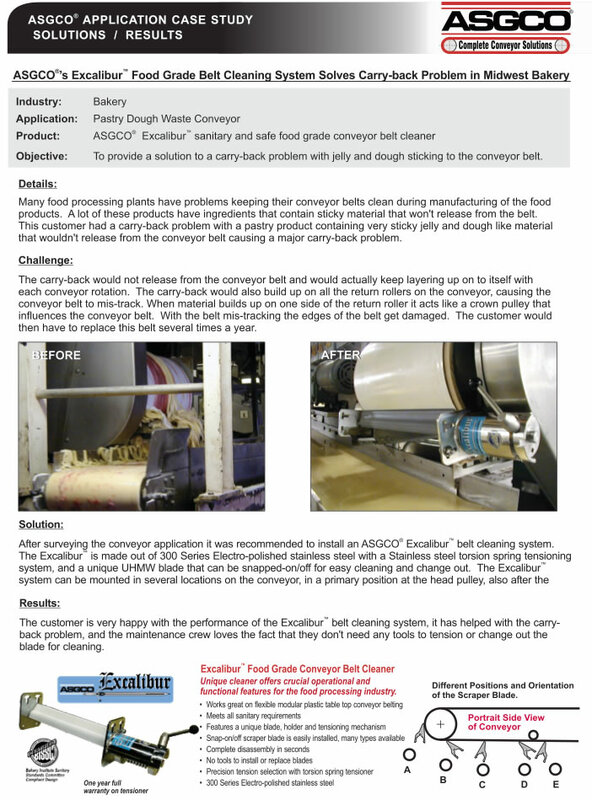 Excalibur Food Grade Belt Cleaning System used in pastry dough waste conveyor application. Objective: To provide a solution to a carry-back problem with jelly and dough sticking to the conveyor belt. Details: Many food processing plants have problems keeping their conveyor belts clean during manufacturing of the food products. A lot of these products have ingredients that contain sticky material that won’t release from the belt. This customer had a carry-back problem with a pastry product containing very sticky jelly and dough like material that wouldn’t release from the conveyor belt causing a major carry-back problem. Challenge: The carry-back would not release from the conveyor belt and would actually keep layering up on to itself with each conveyor rotation. The carry-back would also build up on all the return rollers on the conveyor, causing the conveyor belt to mis-track. When material builds up on one side of the return roller it acts like a crown pulley that influences the conveyor belt. With the belt mis-tracking the edges of the belt get damaged. The customer would then have to replace this belt several times a year. Solution: After surveying the conveyor application it was recommended to install an ASGCO® Excalibur™ belt cleaning system. The Excalibur™ is made out of 300 Series Electro-polished stainless steel with a Stainless steel torsion spring tensioning system, and a unique UHMW blade that can be snapped-on/off for easy cleaning and change out. 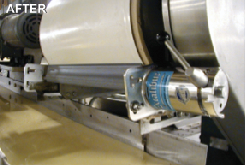 The Excalibur™ system can be mounted in several locations on the conveyor, in a primary position at the head pulley, also after the head pulley in an aggressive or passive secondary position. 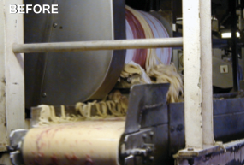 Results: The customer is very happy with the performance of the Excalibur™ belt cleaning system, it has helped with the carry-back problem, and the maintenance crew loves the fact that they don’t need any tools to tension or change out the blade for cleaning.